As Finance Manager, Kevin manages the Finance team, providing financial support to Management throughout the company and working out of the Dubai office. I have an Advanced Diploma in Computer sciences (Networks) at College Of Electronic Technology in Tripoli. I Obtained training courses in first aid, security and armored vehicles. I’ve been working in Security since 2012, with Eni North Africa, The German Diplomatic Mission, Netherlands Diplomatic Mission, and Total oil company. I’m a member of the Libyan Scouts. My hobbies are reading, fitness, and free diving. Erin joined CTG full time in January 2019, after working with the Chelsea Group for several months. As Content and Brand Strategist, she is responsible for Content Marketing as well as compiling and maintaining key brand literature and strategic elements, and maintaining brand channels and touch points. Erin holds a BA Degree in Media and English Literature, and an Honours Degree in Brand Management. With past experience in Advertising, PR and Social Media, Erin brings a fresh perspective into the industry. Iman joined CTG on 4 November 2018 as Country Director in Somalia. She is responsible for the overall strategic leadership and direction of the CTG Somalia programme, and achieving the organisational vision, mission and objectives. Iman has a Master of Science Degree in Sustainable Development from the University of London, and specialised in Development Management at the School of Oriental and African Studies (SOAS). With more than 24 years of professional experience, of which 17 were acquired working with the United Nations in Palestine and Libya, Iman has extensive experience in humanitarian and socioeconomic development processes, and more specifically with the ‘New Way of Working’ that addresses the humanitarian–peace–development nexus. Iman also has a vast experience in aid effectiveness, programme management and global partnership formulation. Her favourite recreational activity is pilates, which she is very passionate about, and she also enjoys reading and exploring the world. Iman is Lebanese Canadian and has a son and a daughter. Outside of work, Jasika enjoys watching movies almost every weekend, shops for shoes frequently and considers herself a pro baker after trying her hand at baking just twice. Kevin has been working in the humanitarian aid sector for the past 6 years in conflict environments in Africa, Asia, and the Middle East for both UN agencies and NGOs. He holds a master’s degree in Conflict, Governance, and International Development. Laila started her career working for a French logistics company. She later joined Symbion Power (a company within the Chelsea Group) who acquired the Ughelli Power Plant in the privatization of power assets in Nigeria. As the Country Manager, she was in charge of the government relations and lobbying of stakeholders in-country. She also consulted for blue chip companies at government levels, namely Emaar and Platinum Group, to help them with entry into Nigeria. Lucy Joined CTG in 2014 having run her own business in Delhi before that. After spending three years based in Kenya and Somalia, Lucy became the Commercial Manager for the MENA region based out of the London office but spending a majority of her time in Tunis, Amman and Beirut. Today she is the Global Account Director. Lucy enjoys the challenge of operating in high-risk locations and believes it is all made worthwhile by enabling clients to implement humanitarian aid and assistance that otherwise wouldn’t be possible. She’s a yoga nut, with a love of travel and used to ride professionally, representing Great Britain. Mahmoud is the Senior Account Manager for Gaza with duties ranging from HR Operations and logistics to resolving client issues, and handling security for his teams. He believes in the power of mentoring and training. With extensive experience in Operational & Field Security Procedures he teaches security plans to staff and monitors its implementation in the field. ‘I help the team meet its goals quickly, with a quality of service, and make people feel happy while doing it,’ he says. Maryam joined us in 2018. As an account manager, she is responsible for looking after our local and international staff in Iraq, including recruitment, on-boarding and general trouble-shooting. Maryam has a bachelor of Architecture Engineering, from University of Cihan, College of Architecture and Urban planning. She has experience in Human Resource and Administration, which she acquired working with humanitarian organizations such as Humanity & Inclusion International Organization in Iraq and Save the Children International Organization. As an Operations and Business Development professional in the private sector for over ten years, Meriam introduced and represented three international brands (Ricoh International, Konica Minolta, and Samsung) in The Sudan and The Republic of South Sudan markets. Meriam also worked as an External Contractor with The United Nations Mission in Sudan and South Sudan, for over five years, managing hardware fleets throughout the peacekeeping mission. In 2017, Meriam joined IOM as the Operations Officer for the DTM Libya program where she managed one of the principal CTG teams in-country. 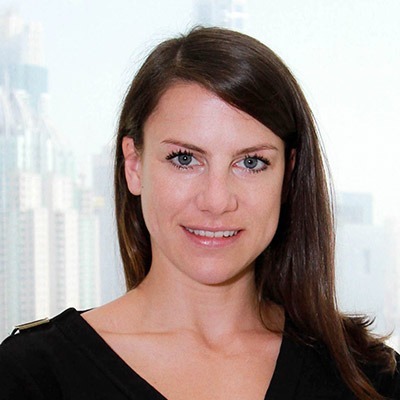 Nicole has experience working with governments, civil society organizations and multi-national companies, most notably with the United States Agency for International Development (USAID), Dubai Land Department, and Her Royal Highness Princess Basma’s youth centres. She previously co-chaired the UAE WEP’s steering committee with our CEO, Alice, and has served on numerous other boards. Nicole is a recipient of two USAID Meritorious Honors Awards, a U.S. Department of State Meritorious Group Award, and received a service medal from the North Atlantic Treaty Organization (NATO) for her work in Afghanistan. She holds a dual Bachelor of Arts degree in Administration of Criminal Justice and Psychology, and a Masters’ in Social Work. She also holds a social work license in New Jersey, US, and was nominated as an official Mentor for the National Network for Social Work Management for her commitment to international social work. Tom supports the team by broadening our bidding capability and increasing our output to help diversify our client base and continue our strong growth trajectory. Tom has a huge amount of experience building businesses similar to CTG and we are delighted to have him in our Business Development team. Yumna joined CTG in 2019. As Digital Content Manager, she is responsible for running CTG’s Social Media in line with our branding and tone. Yumna is an advertising graduate with over seven years in the media and marketing industry. She is proud to be working for a company that supports and uplifts women.